One thing I crave during winter is a Cornish Pasty. Not just any Cornish Pasty though...an authentic Cornish Pasty. When it comes to food there is not much that I am snobby about but when it comes to Cornish Pasties, I am a definite snob! Those so called Cornish Pasties that you get in bakeries and cafes are a travesty. They usually have things like peas, carrots, corn, puff pastry and heaven forfend....chicken!! None of those things belong in an authentic Cornish Pasty. 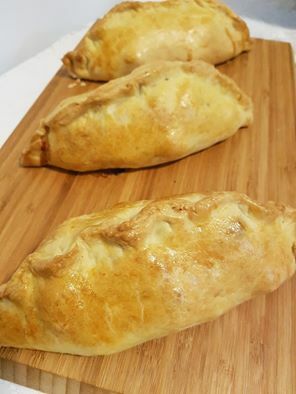 Very simply a Cornish Pasty is a shortcrust pastry wrapped around finely chopped beef, swede, potato, onion, butter and plenty of salt and white pepper. That's it. It's so simple. And don't make the mistake of cutting slits in your pasty to let steam escape - you want the steam to stay in because that is how the filling cooks - the pasty is a mini oven. Don't skimp on the salt and pepper when you are assembling them either - as potato, swede and beef are fairly bland, they rely on the salt and pepper to bring out their flavours. Finally, the pastry is made with lard. Yes, you could make it with butter but the texture of the pastry will be vastly different. The lard gives the pastry a softer, melt in the mouth texture. Do yourself a favour - if you object to the use of lard for whatever reason, don't make this recipe. Lard is king here :-) These won't appeal to everyone but if you like the honest to goodness taste of meat and veg without a whole pile of other flavours, then this will be a treat for you. 1. Preheat oven to 180 degrees. Flour a large baking tray. 2. Place the flour, lard and salt in the bowl with the kneading blade. 3. Pulse for 20 seconds. 4. Select Pastry P1 Speed 5 Time 1min 30sec. 5. Commence program and immediately add water. 6. Continue program until complete or the pastry has come together. 7. Divide dough into five equal (I weighed mine) pieces. 8. Roll out each piece and use a plate or bowl to cut circles out of about 20cm diameter. 1. Dice potato and swede into very small dice - smaller than 1/2cm. 2. Dice onion very finely. 3. Dice beef into very small dice - smaller than 1/2cm. Divide meat into 5 parts. 4. Mix vegetables together well in a bowl. 1. Place four dessertspoons of vegetable mix in a log in the centre of the pastry circle. Leave 1cm clear at each end. 2. Sprinkle white pepper and salt on the vegetables, liberally. Don't be shy with these seasonings. 3. Take a section of beef and place it along the top of the vegetables. 4. Place two generous knobs of butter on top of the beef sprinkle liberally with salt and pepper. 5. Dip your finger in water and wet the edge of the pastry about 1cm in right round. 6. Pull the sides up to form a seam at the top, using your fingers to crimp the seam. 7. Place pasties on the prepared tray and brush with egg wash.